A number of years back, Athearn came out with a model of a 50′ SIECO boxcar in their “Genesis” line of ready-to-run rolling stock models. Amongst some of the flashier US Class I and shortline schemes, one of the paint scheme offerings on this model was a spartan brown scheme with Canadian Pacific’s CPAA reporting marks. Unfortunately, after I actually started comparing the cars to prototype photos, it became clear that Athearn actually made a huge miss with these cars. The colour is rather dark, compared to photos and compared to an Atlas ACF “Precision Design” car offered in a similar scheme (but done right! ), although with weathering, this variation in the cars could be worked out. However the truly nagging failure is in the lettering – and just about everything about the lettering. 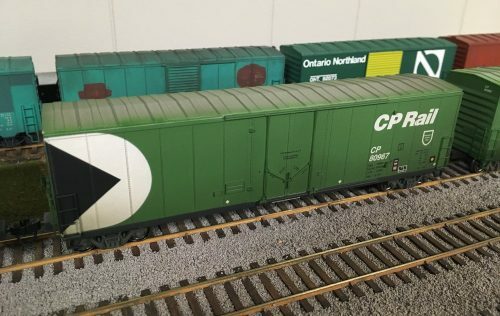 It’s almost as if Athearn took the description “brown car with spartan lettering” and just ran with it, without consulting photos (or the one photo they used was a really unusual, non-standard repaint…). The font isn’t remotely close, the car number is squished into two panels instead of three, and any sort of dimensional data on the right hand side of the car is completely absent. So…. into the alcohol bath went a pair of these cars to get stripped and repainted. The lettering was pieced together from bits and pieces of various MicroScale and Highball Graphics sets. The main reporting marks and numbers specifically came from Highball’s “Transport Gothic” alphabet set, which is fairly close match to the font on the real car. ACI labels, U-1 wheel inspection dots and COTS stencils from MicroScale accesory sets round out the car lettering. 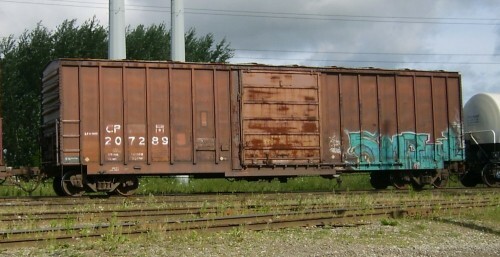 The photo below is the pre-weathering result, while the photo at the top of this post shows the original out-of-the box appearance of one of this car’s sisters. Weathering still needs to be applied, and so far I’ve completed two of these cars, sold off another two at a train show, and still have two more cars of my original six in original factory paint that I haven’t entirely decided what to do with yet – repaint as two more CPAA cars; repaint as some other spartan IPD/pool car, or sell on the train show circuit. 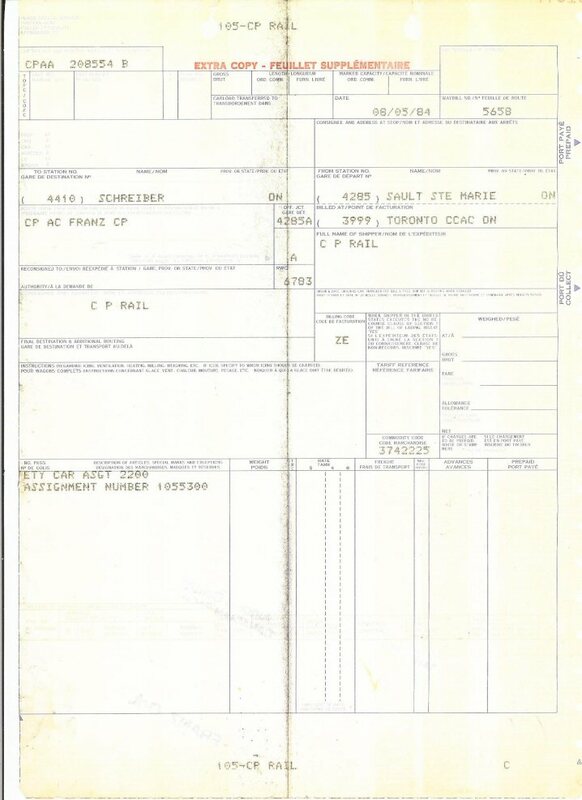 Today’s “Freight Car Friday” post is linked to a scan I received of an empty car waybill for the movement of an empty Canadian Pacific boxcar. 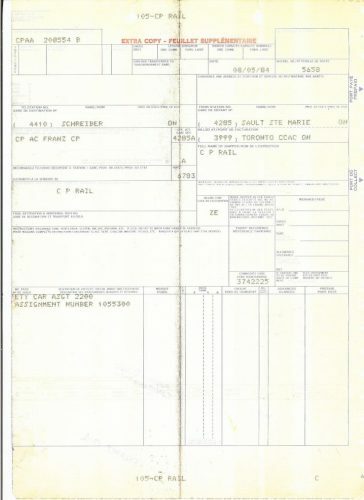 The waybill shown below is for the movement of empty boxcar CPAA 208554 from Canadian Pacific’s Sault Ste. Marie yard to the CP yard at Schreiber, ON, via the Algoma Central from Sault Ste. Marie to Franz. Note a few interesting things about the waybill: there’s no actual shipper or consignee other than CP Rail itself. The notes at the bottom where the load/commodity information would be for an actual loaded shipment indicates a particular assignment number. Presumably, based on its destination, this car is most likely a car assigned to woodpulp loading (which I’ve written about before) and was returned empty from SOO Line to CP Rail at Sault Ste. Marie, and there it received this billing for movement up to Schreiber where it will be reassigned for loading at one of the pulp/paper mills at Red Rock, Marathon, or Terrace Bay. CP (ex-CPAA) 207289 50′ boxcar in the former ACR Steelton yard, August 19, 2004. 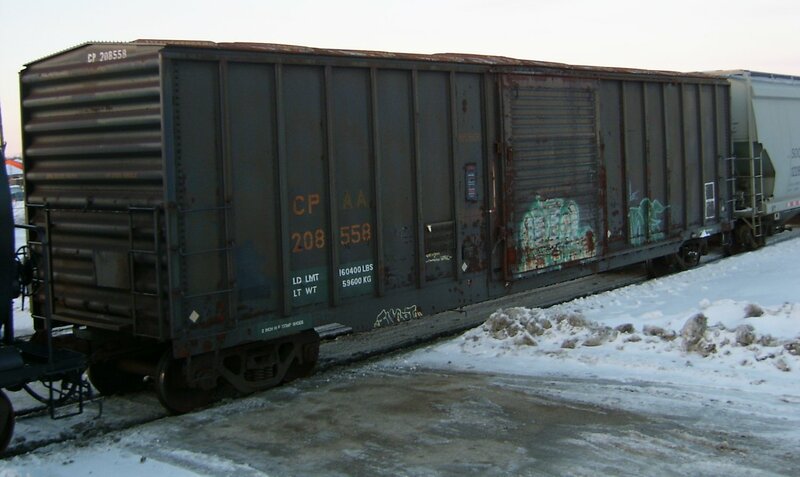 Most likely loaded with paper or woodpulp from the pulp mill at Espanola, interchanged to CN to head into the midwest United States, or possibly provided to the St. Marys Paper mill in Sault Ste. Marie. Cars like this were previously also a common sight hauling baled pulp from mills on the north shore of Lake Superior south over the ACR from Franz.